Hi all, is anyone else excited by the concept of a Cardhop Alfred workflow? One that works, I imagine, like the fantastical workflow. Is such a thing even possible? It seems like it would be incredible. No AppleScript support or URL scheme so far, so there's not an easy point of entry. is what was quoted to me in an email. Hope this helps anyone already using the app/trying to develop a workflow! Hi all, is anyone else excited by the concept of a Cardhop Alfred workflow? In the future, when requesting a workflow for a specific application, please consider adding a link to the application. It makes it much easier for people who know all about workflows, but have never heard of that specific application, to give you a quick "possible/not possible" answer. Thanks! Here’s a link to Flexibits’ site. OP might not have thought of it because it had been heavily featured on the front page of the Mac App Store and making the rounds of several blogs. Flexibits doesn’t mention the URL capabilities on its site. 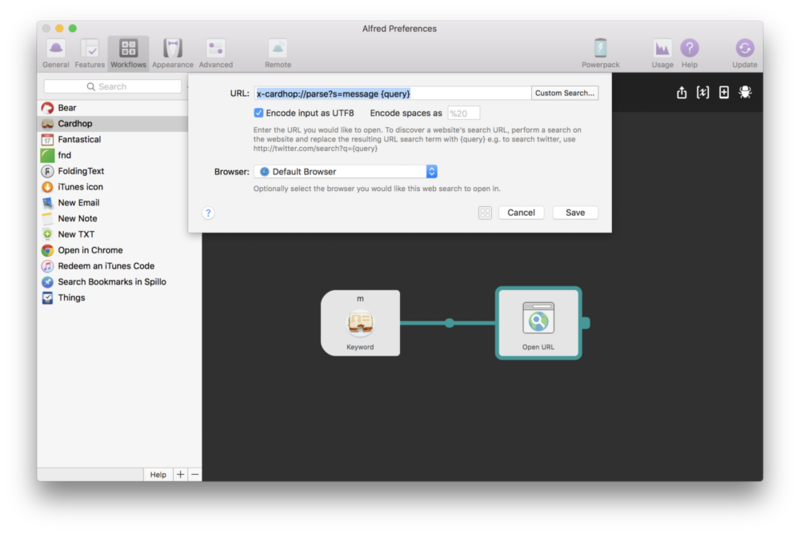 I used the URL handler above to create a workflow that composes a new iMessage to a specific person. Nice. Knowing the developers there'll probably be a lot more capability three or four versions down the line. Feedback take deanishe, and Ehler was right about my thinking. That reminds me. You can see if an app has an undocumented URI scheme by checking its Info.plist. Hey @able, @Ehler and everyone! I uploaded my Cardhop Workflow to the workflow section of the forum if you want to have a look and try it and with some tips to use Alfred with Cardhop. I hope you like it! Best!